On the day of the test run, I called ahead to see if the residents were able to access Wi-Fi for potential email, Facebook and Netflix use, which they were. I wanted to give Nana a training session with the tablet and determine if its presence would result in delight not confusion, happy emails not frustrated tech support calls. If the trial was a success I would leave it for her to keep. I mentally perused my catalog of mobile games and picked out some of my favorite casual titles. My hope was that the tablet would not only entertain Nana and allow her to connect with her family, but also give her some level of understanding of just what it is I do as a game developer. I decided to start with tried and true hits: Fairway Solitaire, Bejeweled 2 and one of the Mystery Case Files hidden object games. Bejeweled and Mystery Case Files I purchased outright and in Fairway Solitaire I used the IAP to unlock all content before heading out for the visit. Fairway Solitaire is one of the games I hold up as a shining example when lecturing on F2P game design. The game is satisfying in short sessions, features high production values, gives the player plenty of free content and embodies my mantra to make purchasing present. Yet it was this very feature set which made me realize it was not an appropriate game for Nana given I needed to tie the device to my credit card to enable purchased content. While teaching Nana to use a tablet, I could see just how many power user features, subtle interactions and overall confusing information was present. This was especially true when I booted up Fairway. I found myself saying “just ignore that,” “don’t press that,” “don’t worry about that button right now,” repeatedly while teaching her the game. I noticed a pattern emerging in the elements she found confusing, and with much chagrin realized that they were all tied to IAP. 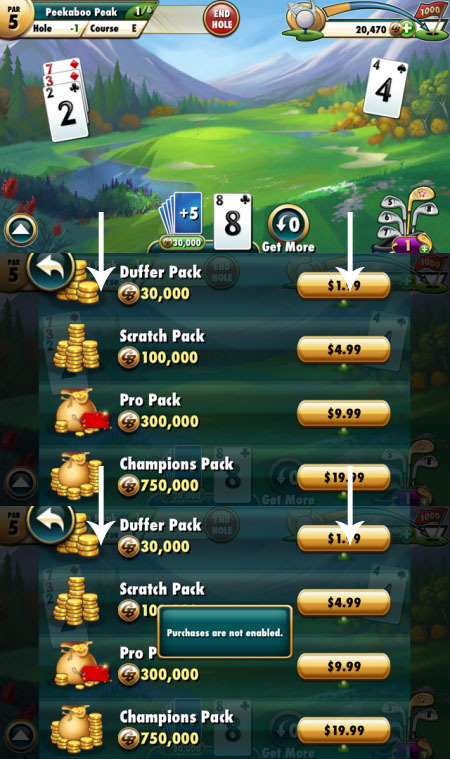 Not having kids, this was the first time I recognized that it would be ideal to have an IAP off button in mobile games. Nothing to break the fundamental experience; simply a toggle in the interface that hides all buttons and UI elements that are asking for money. An off switch for everything I advocate publicly. Without this sort of switch, Fairway was simply too confusing for Nana. Any game with IAP would be inappropriate. I recognize that I would feel the same way about these games if I was considering putting them on a tablet for a small child. I know this is a feature that any game developer (myself included) is unlikely to implement unless required. But it is a shame; despite the overwhelming amount of information in the UI for my extreme beginner audience, I could tell that Fairway was a game my Grandmother and I could share. If you look at the bottom of the gameplay screen, you can see that both to the right and left of the 8 of clubs are buttons that lead to IAP. With the restriction activated, a player is still taken to the purchase currency screen where she gets the “Purchases are not enabled.” message if she tries to buy a package. This is in the vein of what I was talking about, but I am making a case for an in game switch that would hide the in game functionality that leads to IAP.